Those seeking slots play that’s slightly different but not too far off the traditional path have definitely got to try Diamond Chief. From the go, the player knows he/she is in for something different, with that wacky 5-reel layout of rows in 3-3-4-4-4 style; this does make wins a bit harder to come by than on the standard 5-reeler, but, wow, some fat winnings are possible with six like symbols landing. And the 100 paylines in play sure help, too. 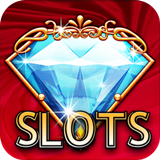 What’s the theme of the Diamond Chief slots game? Well, the majority of diamonds on our planet come from South African mines, so the theme in the Diamond Chief slots game is loosely based on African wildlife – and diamonds. Among the symbols are hummingbirds, elephants, gorillas and waterfalls. (Yeah, I know.) The great big diamond is the scatter symbol, while the Diamond Chief game logo is the wild. How do the wilds work in Diamond Chief? Well, the wilds in Diamond Chief are stacked wilds, but they only appear in reels 3, 4 and 5. Thus are these are bit of a good news/bad news situation: You’ll need matching symbols in the first two (smaller) reels in order to do anything in terms of wins, even if all three right-most reels are filled with wilds. The stacked wilds features is therefore not completely irrelevant, but not as much of a bonus for the player as one might assume. Are there free spins in the Diamond Chief slot? You bet your bruting! Land three or more of the scatter diamonds on a given spin – anywhere on the game screen – and you’ll win 10 free spins. During the free spins bonus round of Diamond Chief, the special symbol added to the reels (a shield icon) acts as a bonus multiplier which awards 2x or 3x more on wins. And free spins are retriggerable, five at a time, when two or more diamonds land during the free spins bonus round. Nice. How much can I bet in the Diamond Chief slots game? How can I play the Diamond Chief slot for free or real money? Just click on the game right here and the window opens, offered a choice of free or real money play. Either way, you’ll be playing safely and securely with – again, we reiterate – never a download necessary. Good luck!